This is a review of the coffee grinder by Hamilton Beachmentioned above. I’ll go over some of the most important features, and then give a review of Hamilton Beach 80365, mentioning some of the pros and cons. I’ll add to that by taking a look at what customers have been saying. Finally, I’ll say a little about any deals or discounts you should be aware of. 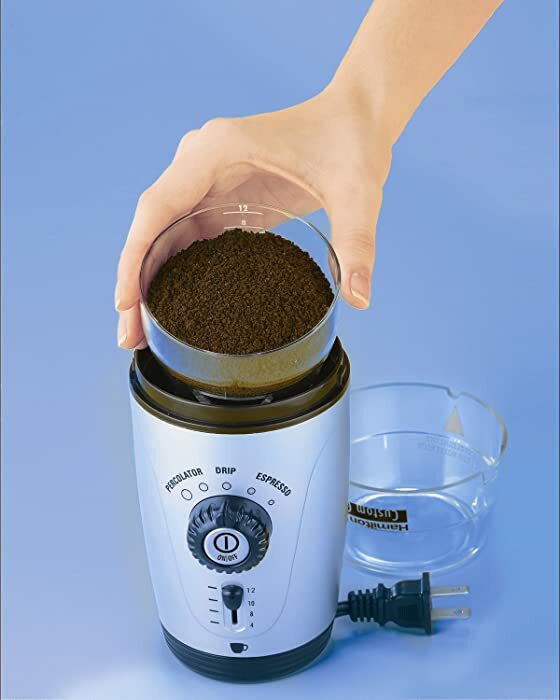 The product is a hands-free coffee grinder. It has five settings for coarseness, making it usable with different kinds of coffee machines. For example, espresso machines take find grinds, French Presses take coarse grinds, and typical drip makers fall somewhere in the middle. There’s also a switch that lets you choose the number of cups, between 4 and 12. With these two options, it’s straightforward to get the right kind of grind for your personal preferences. Some will appreciate that the grinder can also be used for spices. There are a few other features that make it pleasant to use, such as a hidden cord storage that gives it a clean appearance. The grinding chamber itself can be removed, so filling it is easy, and it can be cleaned in the dishwasher. Overall, this grinder strikes a fairly good balance between quality, affordability, and craftsmanship. The ability to easily choose between different numbers of cups and levels of coarseness makes it a good choice for many buyers. An important factor to take into account is your preferred form of coffee. Those who want to experience the highest quality possible in their espressos, for example, may want to look elsewhere. The grounds produced by a lower-end model such as this one may be sufficient, but espresso aficionados would likely claim that they won’t be fine or consistent enough to produce the best possible result. For most people, however, a model like this one would be perfectly sufficient. For the most part, customers are quite satisfied with the product, calling it effective and sturdy. Many enjoy the hands-free aspect that saves labor, and it certainly comes at a good price point. A lot of buyers have also mentioned that it has a neat, tidy appearance and looks good sitting on your countertop. On the other hand, a few people have complained that it has a tendency to stop working sometimes. Overall, the sentiment is positive. This product is only available for Amazon Prime members, but as of this writing, it’s discounted over 50% off the list price. If you’re not currently a Prime member, you should know that it comes with lots of other benefits as well, such as free two-day shipping and instant access to lots of streaming movies. At any rate, you can always give the 30-day free trial a chance and then cancel any time if you’re not interested in paying for the service. Without the current discount, the price would be higher than lots of other entry-level automatic grinders, so this is a good purchase for those looking for an inexpensive and high-quality grinder.